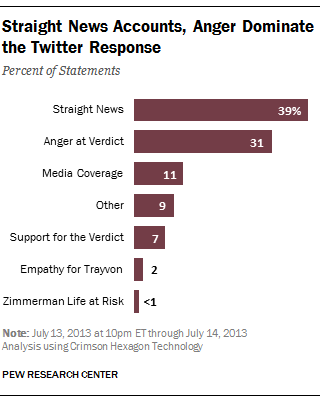 The response on Twitter to George Zimmerman’s acquittal in the killing of Trayvon Martin was almost equally divided between sharing news about the verdict and weighing in on it. And among those offering opinions about the outcome, their conclusion was very different from the jurors’. According to a new Pew Research Center analysis of nearly 5 million tweets about the case in the first 26 hours after the verdict, 39% of the statements on Twitter shared news without any opinion. That demonstrates the degree to which the social media platform functions as a vehicle for disseminating breaking news by both citizens and news organizations. But of the 38% of the statements offering clear views about the result, those expressing anger or opposition to the verdict (31%) outnumbered those in support of the acquittal (7%) by more than 4:1. For determining the tone of the conversation on Twitter, we employed methods that combine Pew Research’s content analysis rules with computer coding software developed by Crimson Hexagon. Crimson Hexagon identifies statistical patterns in words used on Twitter and includes all public Twitter posts. The sentiments decrying the verdict were often emotional and frequently evoked a racial subtext, according to an analysis of the Twitter response to the trial outcome from 10 p.m. July 13 to midnight on July 14. Among that group, the largest component (15% of the Twitter reaction ) was criticism of the criminal justice system, including charges that it is biased against African Americans. Another 14% accused Zimmerman of wrong-doing, such as deliberately profiling Martin. And 2% spoke of Trayvon Martin as an innocent victim. The next highest level of attention (11%) was devoted to the media’s role in the case—an issue highlighted by Zimmerman attorney Mark O’Mara’s public condemnation of the press after the verdict. The level of Twitter engagement in the case spiked dramatically after the verdict. The nearly 5 million tweets (4.9 million) in the first 26 hours after the verdict virtually equaled the total volume of tweets (5.1 million) about the case posted during the entirety of the 33-day trial. By way of comparison, there were 4.7 million tweets alone on July 14 in contrast with an average of about 151,000 tweets each day during the trial. The key themes to emerge on Twitter after the verdict reflect the sentiment tracked by Pew Research back in 2012 as news of the Martin shooting surfaced in the mainstream media. In the period from March 17-28, 2012, calls for justice for Martin, expressions of sympathy for him and his family and outrage toward Zimmerman represented the biggest component of the conversation, at 40%. By contrast, only 6% of the Twitter sentiment at the time involved a defense of Zimmerman’s actions or skepticism and doubts about Martin. Back in 2012, the role of race was an explicit theme in 8% of the statements on Twitter. In many of the tweets that voiced anger after the verdict, race was either manifest or lurking closely below the surface—with a new focus on the criminal justice system. Miss Priss. tweeted: “Emit till, Sean bell, trayvon Martin, and Kendrick Johnson…. Who is next?” Till was a 14-year old African-American murdered in 1955 after supposedly flirting with a white woman. Johnson was an African-American teenager whose recent death in a high school gym has triggered charges that local law enforcement authorities have mishandled the case. The tweets criticizing Zimmerman often focused on his role and actions as a neighborhood security watchdog. “Zimmerman HAD choices. He could have stayed in truck with door locks or drove away/waited for police #trayvonmartin,” tweeted @TheFocuus. A number of professional athletes received attention for their tweets in the aftermath of the verdict, including pro football player Roddy White, who wrote that the jurors should “kill themselves for letting a grown man get away with killing a kid,” and later apologized for his “extreme” remarks. The more infrequent tweets supporting the verdict stressed the idea that Zimmerman had acted to protect himself. “Y’all were stupid to ever thank that man deserved to go to jail. It was self defense. Case closed. I’m glad he’s free!,” tweeted Heather Eller. More than that, though, some social media users expressed the view that despite his freedom, Zimmerman would not and could not resume a normal life. “honestly Zimmerman might have been safer in jail at this point,” tweeted Taylor Christie. Note: This post has been updated to explain more about our methodology.